“This is a unique situation where strong demand is meeting limited supply. Prices can’t rise enough to alleviate the situation. Therefore, the market is responding by placing an immense number of orders into the backlog. Fleets are reserving places in line, so they can get the maximum number of trucks in the future. The transportation industry, and particularly trucking, is highly cyclical. The above charts along with Ake’s comments show why: When demand for shipments surges – as it has been doing for over a year since the transportation recession that had occurred even while the overall economy was being kept afloat by the service sector – trucking companies get very confident, and they want to make hay while the sun shines. So they want to expand capacity precisely when everyone in the same business wants to expand their capacity. So, orders for Class 8 trucks skyrocket, out of the dumpster. Manufacturers, after having laid off workers and shut down shifts, are scrambling to get them back. 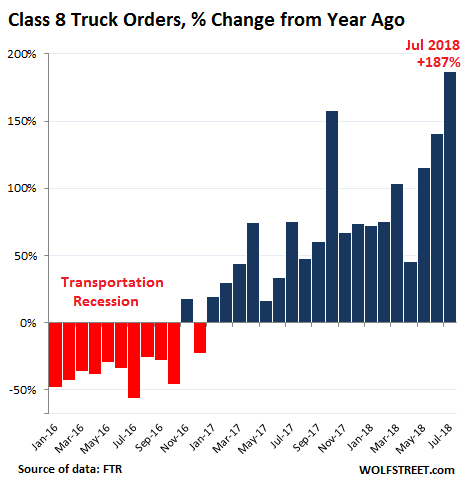 But because the backlog is growing, and orders are not being filled quickly, trucking companies order even more, hoping to get some units, and this inflates orders further and strains manufacturing capacity all the way up the supply chain. Then, as manufacturers and their supply chains catch up, these orders get delivered. And trucking capacity soars. And by that time, demand for transportation in the goods-based portion of the economy, which is also cyclical, tends to level off, and the cycle starts all over again. But for now, let the good times roll. Demand for shipping has been very strong across all modes of transportation. Freight shipment volume by truck, rail, air, and barge jumped 7.2% compared to a year ago, and the total amount spent on freight by all modes of transportation jumped 16%. Read… What’s Going on in Trucking and Rail? This completely explains why there was interest in Tesla’s/Musk’s fantasy long haul trucks in the recent past. Any truck is better than no truck, and if the delivery units are not to spec the order cancels automatically, so the risk is only in the “deposit” if and only if it is non refundable. Apart from a “strong economy”, many of the increased orders are likely due to the immediate expensing provision of the 2017 tax cuts, which lasts for 5 years. The Treasury and IRS released the final guidelines yesterday. How much of the increased in volume in shipments is due to vendors ordering input components, intermediate and finished goods to get ahead of Trump’s tariffs? In the percent change bar graph, “Transportation Recession” should be changed to “‘What anti-business crap is this community organizer going to come up with next?’ recession” Note the spikes in November 2017 and January 2018. What happened then? It’s called “business optimism” due to a business friendly POTUS. November 2016 and January 2017. Gee, someone didn’t read the article or any of the others Wolf regularly posts about transportation. Construction booming here in so cal. Especially commercial industrial. The excitement level is on par with an ant colony swarming a piece of discarded orange. The foresight is similarly matched. I am in the process of placing a order on a new Peterbilt, delivery time will be late March 2019, usually it is around 90 days for me to receive my trucks. I am being extremely cautious in purchasing new equipment, my gut feeling is we will be slowing down soon. Rob, your time frame sounds about similar to what I’ve heard from others. That’s a long wait! Great. More trucks on the highway. You can’t even drive from Portland to Eugene anymore- bumper to bumper traffic any given time of day, even late hours, and too many trucks. It may be a bumper sticker, but it’s still true. Everything you have came by truck. Unless you want a railroad siding to your house, it won’t change. Question: what is all the new freight, that is maxing out current rail and trucking capacity, and where is it going? In rail the growth seems to be in intermodal, which is having a record year, but what is getting shipped? The shale industry seems to be growing again, so that’s part of it too. Is there other industrial or commercial traffic that is pushing freight loads up? The quotation in the article indicates that this demand is a temporary blip but it is not clear to me why shipping companies placing large orders in the hope of getting more orders filled immediately indicates the situation is temporary. Americans must be spending money like made, I must be the last individual in the country pushed to austerity be circumstance. It would appear Bernanke really did make almost everyone wealthy and they can afford to purchase endless quantities of imported products and the latest $1000 i-phone, doesn’t this point to a robust consumer economy that will keep demand for big rigs strong for years to come. If this is the case Paccar stock might be a good value. The answer came in yesterday’s article: limitless growth of credit. You don’s own anything, the bank does. It works marvelously on the way up, it’s a disaster on the way down. My gut feeling tells me there will be a glut of foreclosed trucks going begging in three yr. or less. Everyone is a general after the battle, but here are my two cents. Manufacturing today operates on the principle of being “lean”. This means you hire “just enough”, have a utilization rate of >90%, and operate on the logic of capacity needs averaged over the next 5-6 years. First they will increase their utilization to maximum outup (work 24/7 with limited and only absolutely necessary repairs). And they will hire some temporary workers, manufacturing technicians. Second, they identify investment cost ($) vs. output (number of items) vs. lead time (time per unit needed to get it into production) and try to get those bottlenecks unclogged that give immediate results. All long term plans are shot down by management to avoid any “unnecessary spending”. Third, they will just keep working like crazy until the surge stops (something like a meat grinder faze). You should be aware, it’s a linear supply chain. It doesn’t matter if half the suppliers increase their capacity, one is enough to stop the system. So, if this is temporary, we will see longer que times, eventually settling back to the initial baseline. The higher it peaks, the lower it will crash. Since about 2011 new Class 8 diesel rigs have been required to use “Blue Tech,” including special exhaust fluid additives (urea and water), to reduce emissions. Allegedly it also reduces mileage. Thus many truck purchasers have been taking advantage of a loophole that is now closing: buy a rolling chassis instead with an empty engine compartment, rebuild an older non-blue engine, toss that into the new engineless chassis, and save fuel. For several years, new Class 8 truck sales seemed low, but with the rolling chassis loophole closing, the current sales figures are skyrocketing. Much ado about fudging. 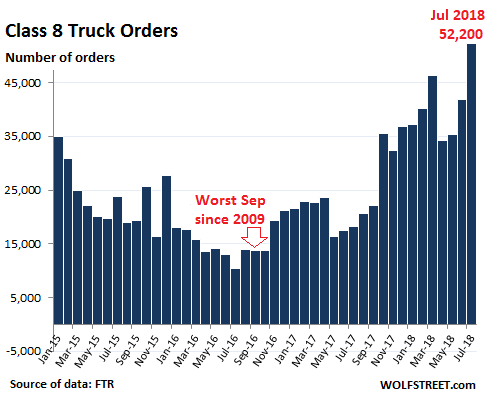 This jump in orders is indeed a “bizarre occurrence” considering what we hear about a shortage of drivers and the industry going to driver-less trucks on our roadways within just a few years. Logic would dictate holding off purchases until further clarification of where this market is going takes place.